We report a cohort study of survival of patients with lung cancer presenting to a single multidisciplinary team between 1997 and 2011, according to symptoms at presentation. The overall median survival of the 3800 lung cases was 183 days (95% CI 171 to 195). There was a statistically significant difference in survival between the 12 symptom groups identified both without and with adjustment for the prognostic variables of age, gender and histology (P<0.001). Compared with the cough-alone symptom group, the risks of dying or HRs were significantly higher for the groups presenting with breathlessness (HR 1.86, 95% CI 1.54 to 2.24, n=359), systemic symptoms (HR 1.91, 95% CI 1.48 to 2.45, n=95), weight loss (HR 2.46, 95% CI 1.90 to 3.18, n=106), chest pain (HR 1.96, 95% CI 1.56 to 2.45, n=159), cough with breathlessness (HR 1.59 95% CI 1.28 to 1.98, n=177), neurological symptoms (HR 3.07, 95% CI 2.45 to 3.84, n=155) and other symptom combinations (HR 2.05, 95% CI 1.75 to 2.40, n=1963). Cough may deserve particular prominence in public health campaigns. We have previously reported an attempt to improve the timeliness of diagnosis of lung cancer by raising the awareness of cough as a possible symptom.1 Cough was chosen because it is a common lung cancer symptom and does not necessarily imply advanced disease. In this study we have investigated the extent to which the various presentations of lung cancer may predict outcome. This was a retrospective cohort study. An original database was designed to identify the presenting symptoms elicited at the first secondary care contact for all cases reviewed in the Doncaster-Bassetlaw lung cancer multidisciplinary team (MDT) meeting, presenting between 1 October 1997 and 1 March 2011. 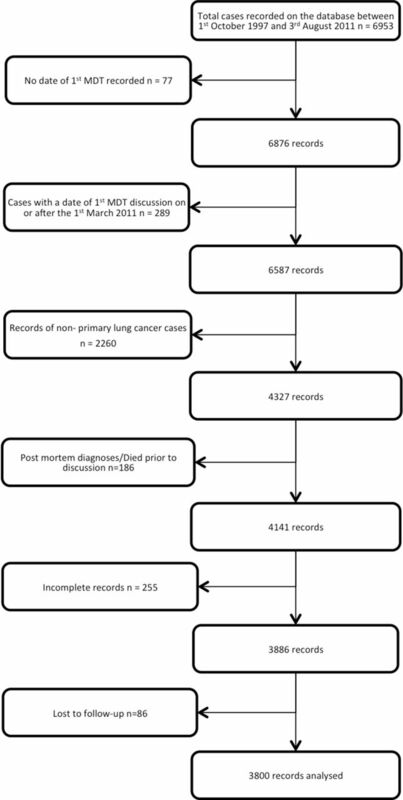 Only cases with a histological diagnosis of lung cancer or a clinical diagnosis based on the opinion of the lung MDT and with a consistent subsequent clinical course were included. We identified 10 groups comprising the most common symptomatic presentations, an asymptomatic group presenting with an abnormal radiograph and a group with rarer symptoms/symptom combinations (see table 1). We preferred the date of first MDT discussion as the reference point from which survival was measured, as the date of diagnosis could sometimes be significantly delayed; this generally occurred within 3 weeks of initial presentation and was available for all cases, irrespective of mode of presentation. Statistical methods are given in online supplementary appendix 1. The Consolidated Standards of Reporting Trials diagram (figure 1) describes the case selection. A similar average age at presentation and a male predominance were found in all symptom groups (table 1). Consolidated Standards of Reporting Trials diagram. MDT, multidisciplinary team. 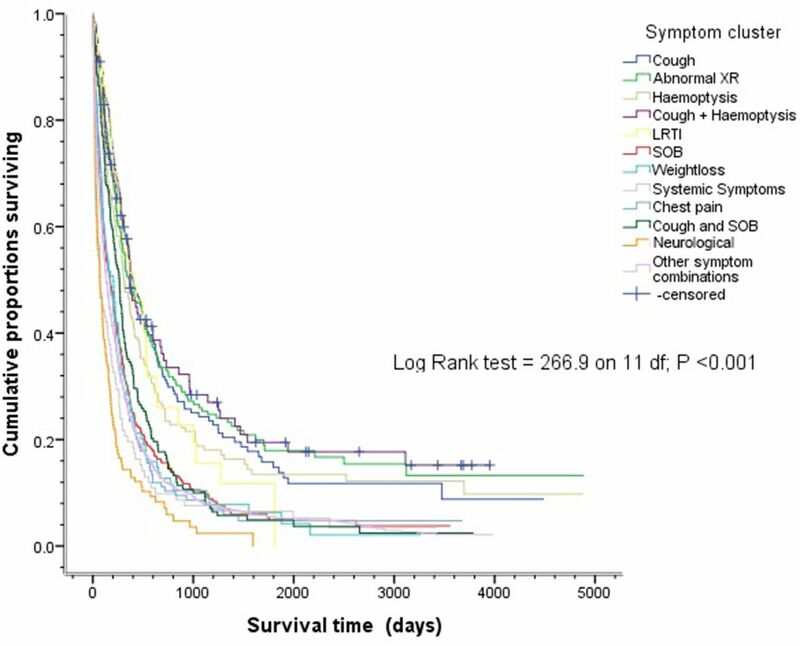 The overall median survival of the 3800 lung cases was 183 days (95% CI 171 to 195), and was significantly better for patients presenting with cough (n=226, 398 days; 95% CI 316 to 480), haemoptysis (n=188, 308 days; 95% CI 248 to 368), cough and haemoptysis (n=100, 370 days; 95% CI 300 to 440), and lower respiratory tract infection (n=52, 410 days; 95% CI 218 to 602). Survival after cough presentations was similar to that of the abnormal radiograph group (see table 2 and Kaplan-Meier curves in figure 2). The difference in survival between the 12 symptom groups was statistically significant both without (log-rank P<0.001) and with adjustment for the prognostic variables of age, gender and histology (ie, small cell lung cancer (SCLC) vs non-small cell cancer (NSCLC)) (P<0.001). We undertook a symptom group × SCLC interaction analysis because of the more aggressive behaviour of this tumour. The 518 cases with SCLC were more likely to present with ‘other’ symptom combinations (62.9%) and were less likely to present with cough/haemoptysis (9.3%) or with an asymptomatic radiological abnormality (2.9%). Although the survival of the SCLC group was significantly poorer, there was no statistical evidence of a presenting symptom cluster by SCLC interaction (P=0.40), indicating that the effects of presenting symptoms on survival are similar across the SCLC and NSCLC patient groups. There are several possible explanations for the far superior prognosis of symptomatic patients presenting with cough (either simple, associated with haemoptysis or with purulent sputum), with a median survival approximately twice as long as that seen after any other symptomatic presentation. Most obviously these symptoms were associated with earlier stage and consequent higher radical treatment rates. It is therefore possible that these symptoms may correspond to discovery at an earlier stage in the natural history of the cancer when patients are still amenable to curative treatment. Other putative factors that a priori may have contributed to the improved survival of patients presenting with cough include histological type, response to symptoms and serendipitous discovery. The cough symptom groups were more often associated with squamous cancer (32%–38%, compared with 16%–25% for other presentations). There appears to be only a minor survival advantage for squamous cell carcinomas over adenocarcinomas (adjusted median survival 44 vs 45 months, respectively2), and the persistence of the superior survival following adjustment for histology suggests that histological type was not a determinant of improved prognosis. As expected, small cell carcinomas were infrequently identified as asymptomatic radiological changes or with isolated cough/haemoptysis. Because patients with cough without haemoptysis and cough with purulent sputum fared just as well as those with haemoptysis, more rapid response to symptoms does not seem to be an explanation either. Serendipitous discovery, when symptoms are due to another cause, could give rise to overdiagnosis bias and lead-time bias. Most cases of overdiagnosis in screening studies are due to bronchioloalveolar cell/minimally invasive adenocarcinomas, of which there was no excess in our study, suggesting that overdiagnosis is unlikely to be responsible. Lead-time bias is also unlikely to explain our results because the survival rates out to 5 years and beyond from diagnosis remained superior in the cases presenting with coughs, indicating a higher rate of cure. We were unable to correct for comorbidity, which may have contributed to additional presenting symptoms such as breathlessness, weight loss and so on, and may have mediated some of the outcome differences observed. It is also possible that patients presenting with a single symptom in primary care could have developed additional symptoms in the interval leading up to secondary care assessment, especially with more aggressive cancers. Ades and colleagues using case–control methodology failed to show any relationship between lung cancer symptoms recorded in primary care and disease stage, concluding that there is little prospect of improving outcomes by earlier detection of symptomatic disease.3 4 Although our population was likely to be slightly later in the natural history of the condition, our findings seem to contradict that conclusion, at least in relation to the symptom of cough. This may be because our study is much more powerful, with theirs only including 247 patients with lung cancer. It is probable that these results are generalisable to British patients presenting with lung cancer. We do not yet know for certain that expediting the diagnosis in patients complaining of isolated cough in its various forms will improve outcomes, but these symptoms are certainly logical choices for awareness campaigns. Contributors The research was planned by TKR, who also designed the database used. Additional data were collected by VLA , who performed the initial statistical analysis and drew up the first draft of the manuscript. SJW collaborated on the statistical analysis, separately replicated it and performed the additional analysis requested by the reviewers. TKR and SJW extensively revised the document into the present form. TKR is responsible for the overall content as guarantor. Ethics approval South Yorkshire Research Ethics Committee. Data sharing statement Additional data available on request.